From 1904, Harry MacDonough sings the classic early vaudeville-era song Good-Bye My Lady Love. Announcement "Good-Bye My Lady Love, sung by Harry MacDonough. Edison record." Not really a love song, torch song, blues, nor ballad  Good-Bye My Lady Love, whatever its classification, is a standout with its great catchy tune. The faint hollow "thunking" sound in the background through much of the last half of the recording was likely caused by swaying motion with the recording horn apparatus. 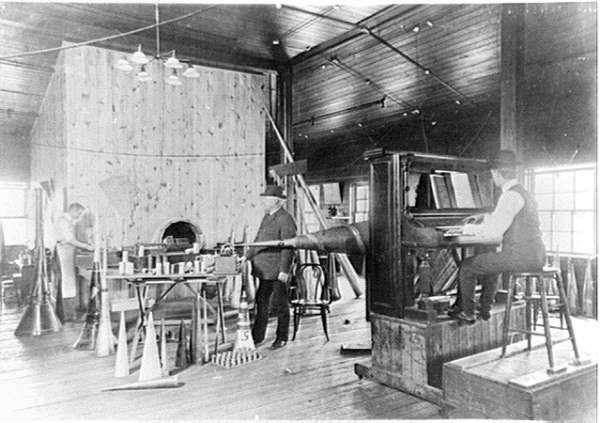 The large recording horns were usually held in place with cables or stands on the performers' end, and connected directly on the other end to the recording phonograph. As the recording progressed, the phonograph-end of the horn was guided along the length of the wax cylinder by the phonograph mechanism. It would not take much, a small jostling or a stiff pivot, to start the horn swaying. In fact, I've run across wax cylinder recordings where the horn is thunking away throughout! When played on most antique phonographs, these horn-thunks are not usually audible. However, the digital playback process used here at tinfoil.com can often bring out "hidden" or other ambient sounds from these early recordings. No. 8684, "Good Bye, My Lady Love," is a sentimental song by Harry MacDonough, with orchestra accompaniment. Joseph E. Howard wrote both the words and the music. The air is extremely pleasing, and Mr. MacDonough sings it in a finished manner.